Simple and inexpensive choice for above ground pools. For above ground and small in-ground pools. Smart navigation and mapping system. Active scrubbing to get rid of stuck dirt and algae. 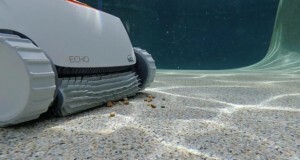 If you’ve always wanted to make the leap from manual pool scrubbing to a robotic pool cleaner but think they are too expensive, the Dolphin E10 (also known as the Dolphin Echo) is perfect for you. It is not as powerful a wall- and step-cleaner as pricier Dolphin models like the Triton Plus or the Nautilus, but it’s a fine floor cleaner and plenty good enough for most above-ground smaller in-ground pools. For less than $500, you get premium features such as smart pool mapping, effective brushing, a quick water release system and natural top-access filters. 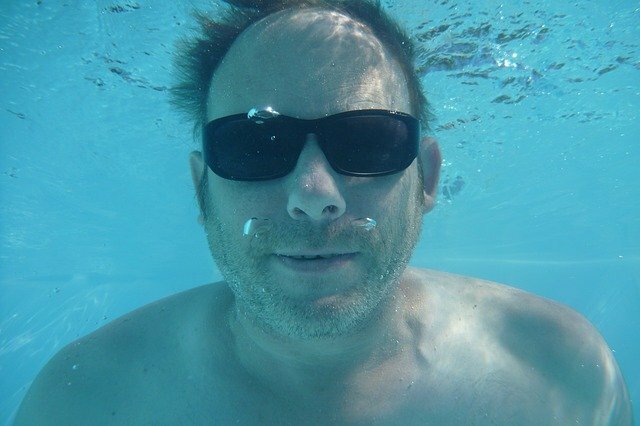 It’s mostly an above-ground pool cleaner, but you can also use it in a small in-ground swimming pool. Read on for my full review of the new Dolphin E10 robotic pool cleaner. If this not quite what you are looking for, see my top recommendations for above ground robotic pool cleaners and in-ground robotic pool cleaners. 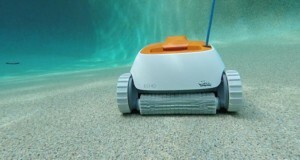 The E10 is not the most advanced robotic pool cleaner around, but for the price it does a fine job. Let’s start with the CleverClean system. Instead of just wandering around the pool randomly, the cleaner first scans it to determine shape and size. It then uses an algorithm to calculate the most optimal cleaning path. This saves more energy and ensures the cleaner doesn’t miss spots. When it starts cleaning it deploys two tools to provide a thorough cleaning. First, there are the active cleaning brushes. The brush rotates rapidly as the cleaner moves around the pool, unsticking any stubborn dirt and algae. Then there is the powerful suction system that picks up the dirt together with any debris that is floating in the water. All the dirt and debris is collected in the large top-access net canister. This is where the first significant limitation of the E10 comes in. The filter can only capture more significant bits of dirt like leaves, twigs, and insects. All the fine bits simple pass through it. If you want proper filtration, you have to buy a fine filter separately. Another big issue is steps and wall cleaning. The Dolphin E10 cannot climb walls or clean the pool steps. While some customers say that it can climb short walls in small above ground pool cleaners, be ready to scrub the walls and steps manually. Overall I’d give it a 4/5 regarding cleaning ability. It’s an excellent buy for those who are looking for something low-budget. But you have to contend with buying your filter and cleaning the walls and steps yourself. This is a technology used in several Dolphin pool cleaner models including the pricey Dolphin Triton Plus. It consists of sensors that map out your pool’s shape and size and an algorithm that determines the best cleaner path for the robot. This saves a whole lot of time that the cleaner would be spending randomly wandering around the pool. This results in less energy usage. It also ensures there are no missed spots on the pool floor. So if you notice the robot cleaner hesitating or wandering around aimlessly the first time you put it in the water, it’s just getting the hang of things. By the second session, it will clean faster and more efficiently. The Dolphin E10 uses a single brush to scrub dirt and algae off the pool floor. But rather than stay still, it rotates as the robot moves. It rotates twice as fast as the robot cleaner. 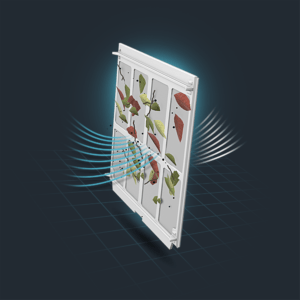 The rotating system, what Maytronics calls Active Brushing, allows the cleaner get rid of even the most stubborn of dirt stuck on the pool floor and in corners. Together with the suction system, the Dolphin E10 leaves your pool sparkling clean. The Dolphin E10 moves around on tracks rather than wheels. This gives it a stronger grip on different types of pool surfaces. It doesn’t get stuck on the drains and doesn’t keep slipping, which causes energy wastage in wheeled robots. Robotic pool cleaners are generally not light. Some can weigh up to 20lbs or more. This does quite a bit of work to lift it in and out of the pool especially when it’s full of water and debris and to transport it to and from storage. The Dolphin E10 weighs just 13.9lbs, making it easy to lift and carry by hand. Also, it has a rapid water-release feature. As you lift it out of the pool, it quickly lets out any water inside, making the robot lighter and easier to lift. No need to hurt your back or break a sweat. The fast-release system is designed to prevent any debris from running back into the pool, a common problem in some pool cleaners. I wish Maytronics had included a fine filter rather than leaving customers to buy it on their own. But at least they made sure you’ll have an easy time getting the collected debris out of the robot. The filter canister is accessible from the top. There is no need to turn the cleaner upside down. Just pull out the canister, remove the debris and hose down the filter before easily sliding it back into the robot. The filter canister is fairly large and can hold quite a bit of dirt before you need to empty it. 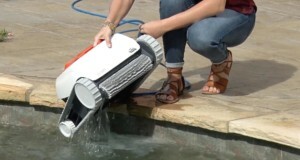 Remember to get fine filter cartridges when you buy this robotic pool cleaner – they cost about $50. Maytronics only includes a clear filter which doesn’t capture the smaller bits of dirt and algae. 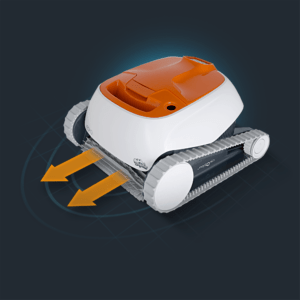 Even if you’ve never used a robot cleaner before, the E10 will be a breeze to use. There’s only one button on the power unit, the on/off switch. Of course, this also means you miss out on features like a timer, multiple modes, and auto-scheduler. But these features are not necessary when it comes to cleaning performance. 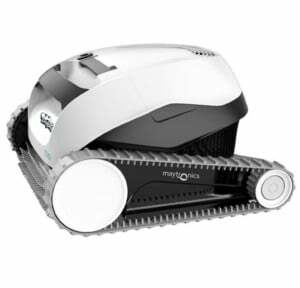 For those who are looking for a basic, reliable robotic pool cleaner, the E10’s ease of use is a big plus. It’s not just easy to use, the E10/Echo is also easy to maintain. Most of the maintenance tasks like cleaning the filters or taking apart the robot for a deeper clean are things you can easily take care of in 5 minutes or less with no tools. In case there is a problem that needs more expertise, Maytronics has designed the E10 for quick modular repair. Replacement parts are cheap and easily accessible. Your local dealer will most likely be able to handle any issue without having to send the unit to the factory. Affordable. You don’t have to spend a thousand bucks or more to get a good quality robotic pool cleaner. The Dolphin E10 is a decent pool cleaner that costs less than $500 while also giving you a nice variety of premium features. A great bargain overall. Smart mapping and navigation. 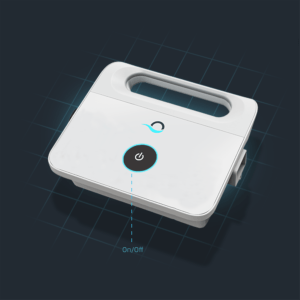 Instead of wandering around and wasting time (and energy), the Dolphin E10 quickly maps out your pool and determines the most time and energy-saving path to take. That’s why a full cycle takes just 90 minutes. Large top-access filter.It collects a lot of debris without filling up too quickly and at the end of the cycle you just need to pull it from the top of the robot. Easy to lift in and out of the water. Thanks to the lightweight design and rapid water release feature of the E10, you can get it as a gift for your elderly parents or grandparents without worrying that it’s too heavy. There’s even no need to buy a caddy. Ideal for above-ground and in-ground pools. A versatile pool cleaner that you can use in any type of pool. It also works on all kinds of pool surfaces including fiberglass, granite, plaster and quartz. Reliable and easy to maintain. The E10 is by Maytronics so you can be sure it’s going to last long without causing you endless headaches. It comes with a 1 year warranty and there is a wide network of dealers ready to help you in case of any problem. Parts are easily available and usually inexpensive. Easy to use. Just press one button to clean the pool. Perfect for first-time users of robotic pool cleaners and anyone who doesn’t care much for extra features. No tangling. While the 40ft cable is not swivel, customers say it doesn’t tangle. If you have a ladder going into your above ground pool, the cable will not wrap itself around it. Kinda basic in terms of features. Popular missing items include a filter-full indicator, timer, scheduler and multiple cleaning modes. But this is not a surprise considering the price range. It’s for smaller pools only. The cable is 40ft long, compared to 60ft in most cleaners. This is perfect for most above-ground pools but can only be used in small in-ground pools. It does not climb walls or stairs. Again, this is okay for most above-ground pools. You can easily scrub the short walls yourself. But if you want an in-ground pool cleaner that will clean the walls and stairs, this is not it. Check out the Dolphin Premiere or the Polaris 9550 – the two best wall-cleaners on the market. Equipped with fast water release system. I’ll be honest with you: if you are looking for a capable in-ground pool cleaner that will tackle your large pool, climb walls, scrub the waterline and clean the steps, then the Dolphin E10/Echo is NOT the right choice. Consider a more powerful Hayward cleaner like the Nautilus, Triton Plus, Dolphin Quantum or Dolphin Escape. But if you own an above-ground or a small in-ground pool, then the E10 is a great choice. It cleans floors really well, is easy to use, is cheap to maintain – and the price cannot be beat!